Bounding with energy and optimism first graders delight in the learning process. As parents and teachers we want to make the best use of their joyful confidence and make character building a focal part of each school day. While eager to learn, five and six year old students frequently encounter many conflicts that must be handled in appropriate and acceptable ways. As educators, we constantly search for simple methods to effectively communicate with our first graders. We hope to correct the inappropriate behavior without in any way hindering the natural zeal for learning. Building on the respectful skill of “asking” the Peaceful Solution Character Education Program delves into the concept of self-control with a distinctive approach. Your first graders will love to discover “what belongs to me, what belongs to you”; in so doing they are provided with friendly, non-threatening means to work through conflicts. 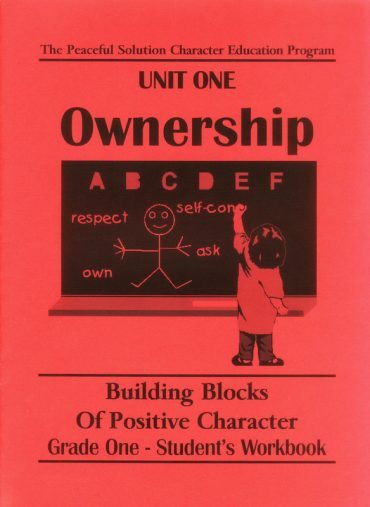 Teaching our children the rights of ownership, at an early age, has proven to be invaluable to their becoming well-adjusted adults. Discover how the Peaceful Solution Character Education Program can benefit the five and six year old children you know and care about.